Friday evening we stopped by this little wine shop to pick up a bottle to have with dinner. two dogs that didn't quite get along, their owners, and several others, I opted to wait outside. It's just such a small space. You really can't have more than five people in there at a time. I liked the window display. The pig in the sleigh was too cute! Saturday afternoon was spent walking around. We walked over to Union Square to look at the vendors that had set up and wandered in and out of shops all afternoon. JD wanted to find an ugly sweater for a Christmas party we were attending later that night. There was no shortage of them at Urban Outfitters where apparently, they think its 1993, in the men's department, at least. But who wants to pay $90 for something to wear as a joke? JD ended up wearing one of his nice sweaters. 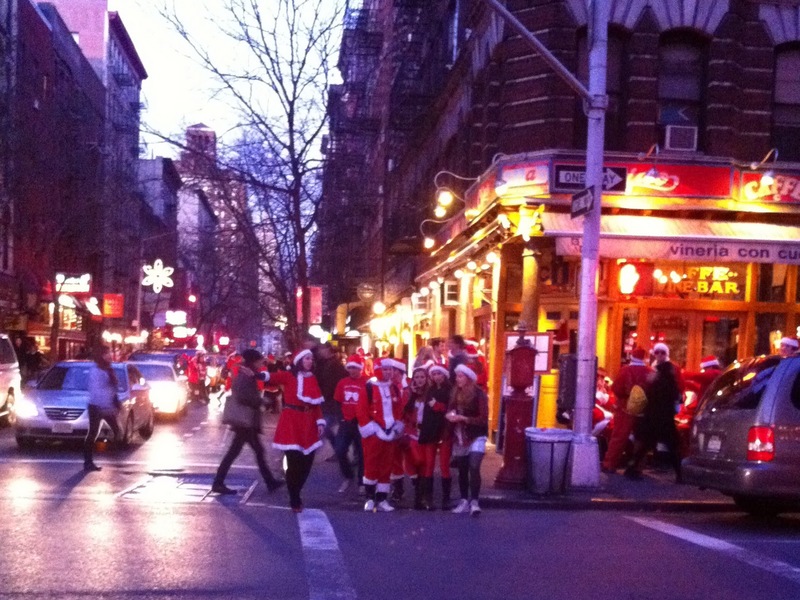 Saturday was also SantaCon. 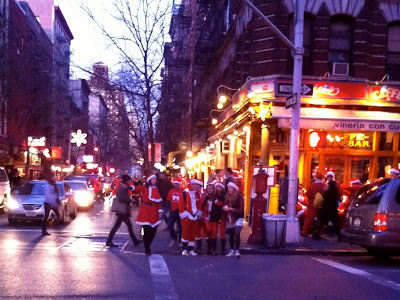 We did not participate, but we did encounter tons of Santas. We made the mistake of heading over to MacDougal St. to get a snack from Qdoba. By 4:00pm it was just messy. I love love love Butter nail polish! It stays on forever. I picked this up in one of the shops we stopped in on our walk Saturday. I love the rosy pink glitter and it looks exactly the same on as it does in the bottle. And that was my lovely little weekend.